Festival season is only around the corner which means your festival clothing collection should be created and ready to go! However, if you’ve been holding out for those extra emerging trends and key pieces to add to your collection, you’re in luck. Whether you want to expand your dress selection, or you need that must-have co-ord set for your shelf, you’ll find all your festival fashion needs right here at Parisian. So, for the top trends for 2018’s festival season, look no further. The perfect accompaniment to any summer event, tropical prints add vibrant colours and eye-catching designs to your existing collection. 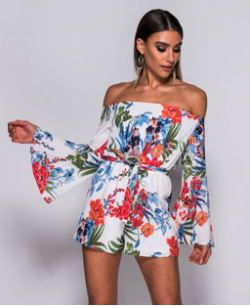 Whether it’s a playsuit or a dress, tropical prints bring an exotic and exciting feel to your collection of clothing. For a dramatic look, opt for a black background with bright flowers like our Tropical Print Tie Front Mini Dress. Festival style is often inspired by bohemian looks, so extra details like flared sleeves can take your collection to the next level. To enhance any existing style, whether it be a jumpsuit or a blouse, frill details can make a huge difference. Creating a more feminine design, frills can create a visual element that make even the simplest of outfits more exciting to look at. The versatility of adding frills to a piece of clothing means that you can add it to the hem, the neckline, sleeves or even waist. Opening up the possibilities for so many different styles, frills are a guaranteed way to transform any piece of clothing. Festival fashion is fun, colourful and unique. With that in mind, it’s important to add a variety of prints and patterns to your festival collection. Once you’ve got your floral pieces, turn your eye to one of the biggest trends of the season; stripes. Flattering and easy to wear, stripes lend themselves to co-ords perfectly. Our Vertical Striped Cropped Top and Bow Tie Shorts Set is a practical and stylish answer to anyone’s festival style. Channelling summer effortlessly, stripes in shade of blue, orange and purple embrace the season and all the social events that come with it. It may sound like an obvious trend for the summer, but maxi dresses that reach the floor are back for SS18 and they make for a perfect, bohemian-style look. Great for festivals, they offer the ideal outfit for those sunny days both here in the UK and further afield! Easy to wear, maxi dresses fly off the shelves every summer thanks to their sophisticated style, complete with extra details like tie waists and side splits. Stay classic and opt for a floral print.